While CCEmuX tries to be as approachable and intuitive as possible, there are times where things aren't as clear as they should be. This guide tries to walk you through setting up CCEmuX, as well as some useful things you can try. Running CCEmuX couldn't be easier! Simply grab the launcher and run it. On your first time running, we'll prompt you whether you want to use normal ComputerCraft or CC: Tweaked. The launcher will automatically download the latest version whenever the emulator is updated. You should get a notification when this occurs: the next time you run the emulator you'll be up-to-date again! CCEmuX offers the ability to control the emulator by the ccemux API and emu command. We'll focus on the second of those, as it's a little more user friendly. Don't feel like you have to remember any of this! The emulator is documented in game, so you can always run help emu if you get stuck. Sometimes you may want more than one computer. Maybe you need to test a chat program, or just want separate workspaces. Running emu open will open another emulator window with a fresh computer. You can also pass in an ID of the computer you want to use. Once you've finished running emu close will close the current emulator window. Of course, you could always just press the "X" button. If you ever need to access a computer's filesystem, run emu data. 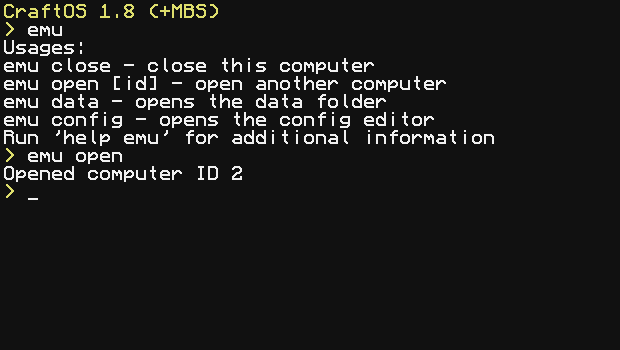 This will open CCEmuX's data directory in your file manager, from which you can access each computer, as well as CCEmuX's configuration files. 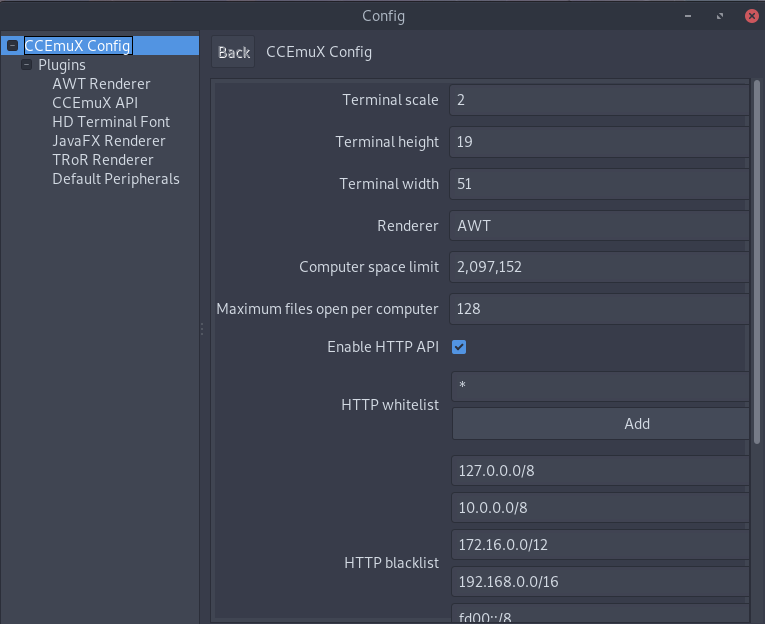 CCEmuX exposes many of ComputerCraft's built-in configuration options, as well as providing many of its own. While these can be changed by hand, it's often easier to use the built-in editor. Just enter emu config to open the config UI. This has a list of every config option provided by CCEmuX, as well as additional groups on the left. Settings are updated straight away, though some may not have any impact until restarting the emulator. If you're a little confused about what something means, just mouse over it. Most config options provide a tooltip which provides a more in-depth description of what it does.